Do you like playing Bingo but wish there were more ways to win? Bonus Bingo is the perfect game for you! Over the last couple of weeks we’ve been talking Bonus Bingo. So far, we’ve covered how to play Bonus Bingo and how to win Bonus Bingo. In this article we’ll cover the very bonus rounds that gives Bonus Bingo its name. The Bonus Bingo multiplier is a bonus that allows you to multiply the winnings of one card of your choice by either 2 times or 3 times. The Bonus Bingo multiplier is awarded randomly when you click on “Play” to start a round of Bonus Bingo. If you are lucky enough to get the multiplier (it appears every 20 games or so), you are presented with the option of which card to apply the multiplier to before the Bingo balls are drawn. Notice at the bottom of the screen it says “You’ve won a Multiplier!” and the little joker is holding a sign that says “x2”. You’ll notice that the Bonus Bingo 3x multiplier screen is very similar to the 2x screen, except for the cool red color and the joker is holding an “x3” sign instead. Once you win one of the multipliers, all you have to do is select which card you want to apply the multiplier to. After selecting your card of choice, the round of Bonus Bingo will continue as normal, except the winnings of the card you chose will be multiplied by either 2 or 3. Yes that’s right, the card in the lower right hand corner won $80 on a $1 bet. How did this happen? Well, looking at the pay table in the middle of the Bonus Bingo screen, we can see that getting 3 lines across on any one Bingo card wins the player $40 on a $1 bet. But since there was also a 2x multiplier applied to that card, the winnings were doubled for a total of $80! One of the other main Bonus features of Bonus Bingo is the Joker Balls or Bonus Balls. If you are playing Bonus Bingo for the first time, you will notice that there is a section at the top of the games screen that reads “Bonus Balls” and has 5 empty slots that are just begging to be filled with said Bonus Balls. So just how do you fill those holes with bonus balls? 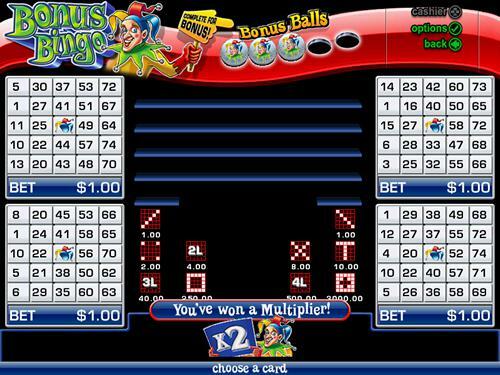 During a normal round of Bonus Bingo, the computer will draw 44 numbered balls. Occasionally, the computer will draw a Joker Bonus Ball instead of a standard numbered ball (this happens about every 20 rounds in my experience). Once the computer draws 5 total Joker Bonus Balls, you are sent to a bonus round where you can win tons of extra cash! Note: Accumulated Bonus Balls will not disappear if you log out of the game or the casino software altogether. Every Bonus Ball which is drawn will still count towards future games until you accumulate all 5 Bonus Balls required to reach the bonus round. When the bonus round begins, you will be presented with 3 different Joker Balls to choose from. Depending on which Joker Ball you choose, you will be awarded a random number number of games in the Bonus Round. Once you select one of the Joker balls, the bonus round will begin. All you have to do is hit the giant red “Play” button to get started. When you click on the giant glowing “Play” button, you will begin a bonus round that is potentially worth hundreds of dollars! Once the Bonus round is started, the computer will roll a number of special Bonus Bingo dice to determine your winnings. The numbers on all of the dice are added together (joker dice are worth 10) and then the resulting number is multiplied by the number in the “Multiplier” box at the top of the screen. The resulting number is your total winnings! As you can see, Bonus Bingo is packed full of ways to win tons of extra bonus cash! Want to get your hands on some of those bonus winnings? Get started right away by clicking on the “Play Now” button bellow and downloading the free casino games software from Silver Oak Casino!